As I struggled through the invisible molasses clogging up Burning Life, I pushed into a dark set of rooms created by the wonderful four Yip and Mescaline Tammas. It was a little oasis of chocolate tears. I turned on the media while looking at a tree and two eyes appeared on both sides creating the impression of a face. The eyes blinked and my new favorite song began to play. There were a number of reasons why this one worked well for me. One was the oasis feel in entering this little universe from within the hectic atmosphere of Burning Life. Great works can be destroyed or enhanced by the environment they are placed in. Brooklyn is Watching sim was an example of a difficult place to set up artwork due to their neon green colouring. If your creation relies on subtle red or greens then its borked as you place it. Fusion avoided this by creating the contrasting mood and then internalizing it for the viewer. The music was perfectly chosen and this may relate only to me, but that song has since become one of my favorites. The song was not added by me but was part of the music contained within the machinima. The walls had media textures on them to show a very graceful movie of slowly blinking eyes. The colour palette is warm and comforting while the build inside of butterflies and trees with dripping chocolate tears is a pleasure to look at as well. Its a time consuming complex build that is made to appear simple. four has always been one of my favorite builders in Second Life for her ability to create endearing works that have never looked forced. She creates effortlessly where other artists set out to create masterworks and fail. Mescaline Tammas is well known for his wonderful machinima. He did a great one of Blotto Epsilon/ Cutea Benelli's work from last years top ten Bogon Flux and here is one I just found of "Fushion" Two great talents. I was surprised to find that one of my top ten favorite things in Second Life from last year was made by Linden Labs. You see, Linden Labs image is in no way edgy or hip in the same way that a company such as Apple have fashioned themself into. On one side LL have created this fantastic virtual world which is so completely frontier its stunning. Yet on the other side their image is eye pokingly boring. In world they are not known for building interesting things. LL needs to perhaps create a quietly cool image of themself. Maybe rename Second Life some kind of Matrixy thing like "The Grid" or something. "Hey I will meet you at that exploding cyber cafe on the Grid later" sounds much cooler than "Hey I will meet you at the welcome area on Second life later". I have met quite a few people who have never been to Second Life yet many of them had the view that its a place where people go who are unhappy with their first life. I mean it is called second after all. Its like having another try at things if you are socially constipated. Anyway, I digress. The whole existence of the Cornfield was a type of mythical legend previously. The only way you knew it existed is if you had done something fairly bad but not terrible in Second Life. The Cornfield is a penalty box of sorts, but a unique and funny one. If you were lets say a cronic griefer, and Linden Labs had decided that you really needed to sit down and think about what you did. They would, rather than just suspend your account, instead make it so that each time you logged in you could only appear in the Cornfield. A place with nothing to do but wander endlessly down rows of corn. Actually there are a few other things you can do. The TV set, I understand, played old episodes of Leave it to Beaver and I love Lucy. You could also climb on top of the red tractor and seed the rows in the garden. Much like comic book villians Second Life has diabolical scripters who bring down whole sims. These bad boys/girls attempt to break out of the Cornfield but instead become children of the corn. Strangely they still log in to go sit there. I loved the Cornfield. The dry humour of it. I don't for a second think it rehabilitated any of those sent there nor do I think the Lindens thought that it would. They were just having fun. "WTF lets make a big assed Cornfield hahahahhahahah!. Yeah with a crappy red tractor hahahhahhaha and a TV they can only watch black and white shows on ahahhahahahahhaha" I hope thats how the conversation went when they thought of it. So good for you Linden Labs you are number 8. 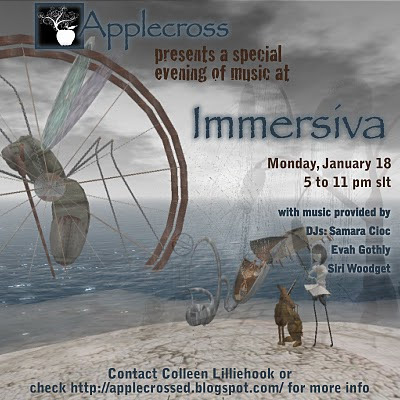 Applecross will be on Immersiva tomorrow playing music inspired by the sim. What is Applecross? well here is their blog http://applecrossed.blogspot.com/ I look forward to hearing what kind of music was chosen for Immersiva. I definitely have seen Siri Woodget on the sim getting a feel for it (pressure rising) Hahahaha just kidding no pressure Siri. If you are online and would like to hear some great music come over. After the event tomorrow I will post the number 8 in my top 10. Its a bit of a surprising one. On occasion I go to live music events in Second Life. I used to hear Colemarie Soleil play and recently listened to the voice of Skye Galaxy. A few months ago I was stunned by the skill of violinist Izabela Joworower, and I think we all have heard about U2 playing in Second Life a few years back. One problem that I always have when I go to see SL music live is that I find it hard to sit still. I need something to do beyond listening to the music. Unfortunately most venues for music try to mimic real life by placing speakers and such around the stage in an attempt to seem "real". I am able to scan these builds for perhaps 30 seconds before I lose interest. Then I move on to profile snooping, playing with my cat Loki in rl, cleaning up my desk etc etc. When I went to see Mummersion by Grace McDunnough, I was impressed with how they had fixed this problem which is perhaps unique only to me, but I don't think so. Each song has a set to explore. When the song ends the seats are transported to a new location and all those who are sitting on those seats go along to the new set. So during each song you are able to cam around and explore the build and once your attention begins to wane its time for a new set and you begin the cam exploration again. So you are not only getting the beautiful voice and music of Grace but also a landscape to explore. I picked this one as my number nine because they have recognized the unique possibilities of performing in second life and used them to their advantage. Its a next step, a progression which this virtual world allows and was only waiting for someone with vision to take advantage of. The sets have been created by a multitude of SL talent and they vary in skill, but overall are quite good. I have shown Grace performing one song in the set and kept filming until the transition to a new set. My machinima could have been better but you will get the idea. Below I am adding a machinima I made for a song Colemarie Soleil did. I wrote a poem called Rusted Gears and one day Cole just plopped this song down on me. She took the poem I wrote and put it to music. I was genuinely touched by this and I absolutely adore what she did with it. Its just one example of the many musical talents in Second Life.